Dear, visitor how are you all? i hope that you are doing well. 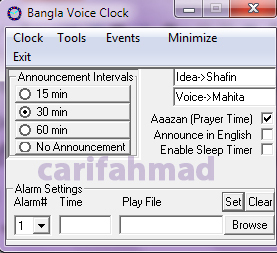 today i am going to present you a excellent voice clock software. by default this clock will alert in Bangla language. But you can change language in English.i think you will enjoy thissoftware best. by using this software you can get alert after every 15 min or 30 min. download now and enjoy this software!!! enjoy!!! provide more knowledge about the world of new tech gadgets.